Sears department store is better known for tractors and washing machines than for floral arrangements. 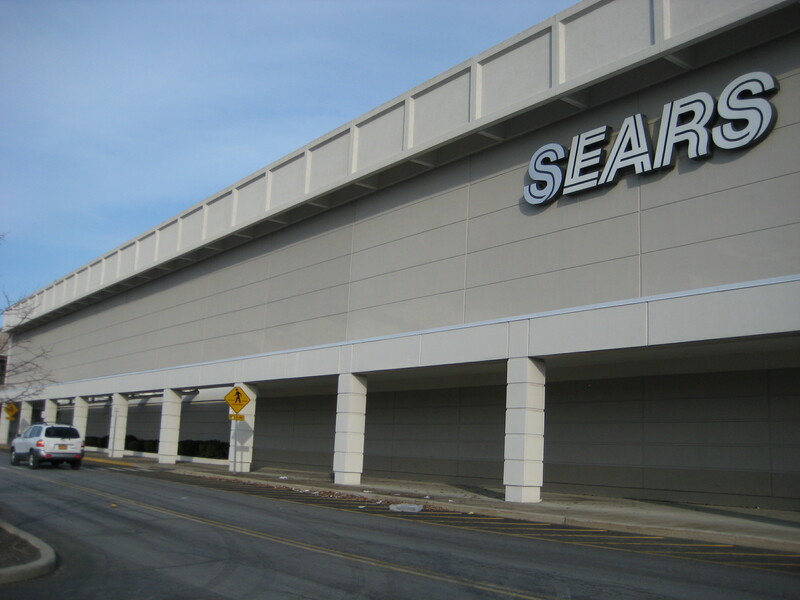 The landscaping around the Sears in Colonie Center Mall, Colonie, NY, is pretty sparse. Actually, once you get up close to these plump round balls of bushes, the foliage is quite nice–soft and green. This is Yew. Planted in almost every American shopping mall and housing development. It’s also planted on zillion-dollar estates and world-famous historic sites, like Windsor Castle and Versailles. Because yew is an obedient plant. You can shape it into almost any shape you want–it’s like botanical Silly Putty. It can tolerate “extreme pruning”–doesn’t object to being trimmed by a hedgeclipper into the most outlandish shapes–a dragon, a giraffe, a castle, or a softball. There’s a bewildering variety of yews, both trees and shrubs: English yew, Mexican yew, Himalayan yew, Japanese yew. 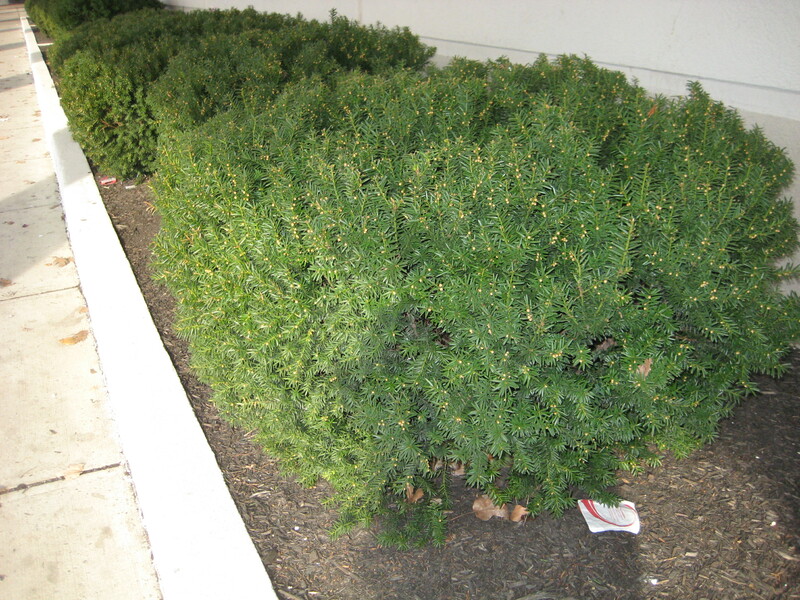 The fat green shrubs planted for landscaping are usually crosses between English and Japanese. All the yews are tough and hardy; slow growers, but also quite long-lived. An English yew tree can live up to 2,000 years. Yes. Two. Thousand. Years. 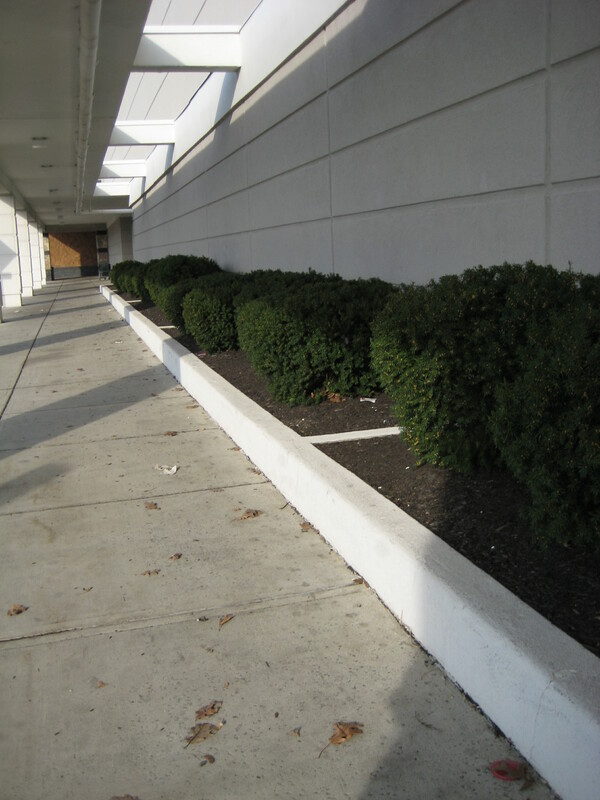 This row of bushes may still be standing when Sears has crumbled into dust. 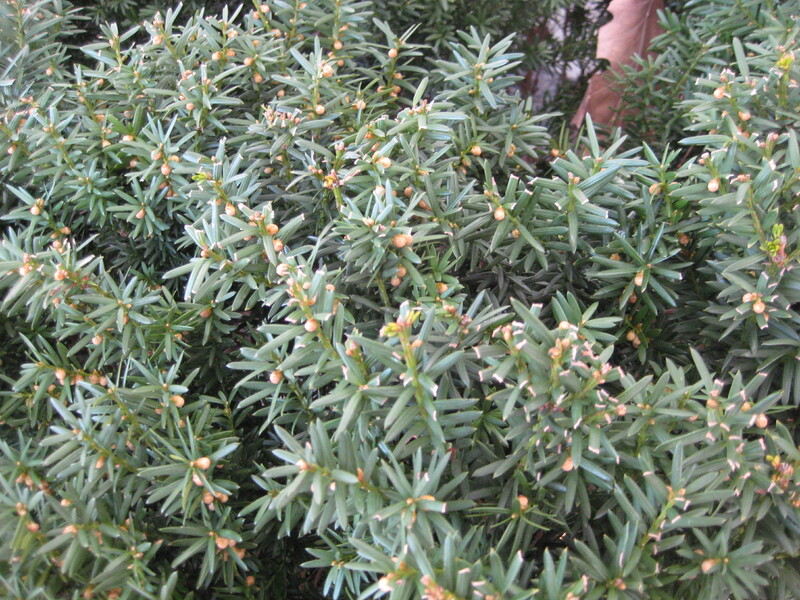 On the third hand, the oil found in yews, taxol, has been used as a cancer medication in many cultures for centuries. Even today it’s a powerful cancer-fighting drug. Suicide weapon. Christmas decoration. Deadly poison. Life-saving medicine. Bird food. Castle topiary. Bonsai tree. Suburban mall decor. You wear a lot of hats, yew. Two yew recollections: Would have children on nature walks taste the sweet berries with the warning not to eat the poisonous seeds. Watched a warbler take a bite from a fruit and fly back to a nearby branch with a foot-long mucous strand between the bird and the bush. P.S. Could never get them to grow well in Cohoes clay soil. What a good idea to have kids taste the berries and then tell them about the seeds being poisonous. Kids being kids are going to nibble on stuff–information is the best protection we can give them! Amazing – especially the ,2000 years part!